With Passover once again upon us, it's the time to know about the origin and traditions associated with the occasion. The history of Passover dates back to the period between 1450 BC - 1650 BC, when the Jews escaped from the clutches of the Egyptian Pharaoh Rameses II. 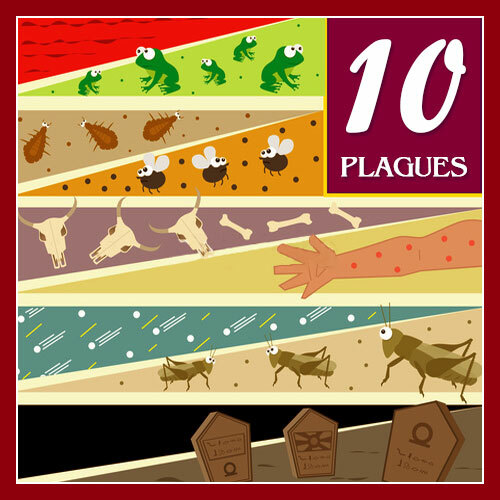 Let us take you on a brief tour through the fascinating tale of the ten plagues, an event supposed to have taken place then and which helped the Jews attain their freedom from Rameses. This event is also mentioned in the Holy Bible. If you like our captivating article on the Ten Plagues, please click here to refer this page to your friends and near ones and spread to them the spirit of Passover. Enjoy a Happy Passover with TheHolidaySpot. The fascinating story of the ten plagues is linked inseparably to the life of Moses, the deliverer of the Hebrews. Moses was the son of a Hebrew. Long before Moses was born, the Hebrews were attacked and made slaves by the mighty ruler of Egypt, Pharaoh Rameses II. Once, the Pharaoh Rameses I ordered all newborn Hebrew boys to be killed. To save her newborn child, Moses' mother hid him in a basket, and floated it into the river. He was found by the queen who took pity on the newborn baby. Moses ended up being brought up into the Egyptian royal family, his identity unknown to them. On reaching adulthood, he came to know of his identity. Angered by the brutal treatment meted out to the people of his race, he killed an Egyptian slave master in a fit of rage. To avoid punishment, he escaped to the desert, joined a group of shepherds and became a shepherd himself. One night, he was imparted supernatural powers by God and commanded to be a deliverer of the Hebrews. Moses returned to Egypt with his elder brother Aaron and approached Pharaoh Rameses II, son of the previous Pharaoh. He delivered to the Pharaoh God's demand that the Israelite slaves be allowed to leave Egypt for 3 days for the purpose of observing a holiday of worship and prayer for their God. When the Pharaoh refused, Moses and Aaron went away to return again the following morning. They showed him a miraculous sign of warning - Aaron's staff turned into a serpent. Pharaoh's sorcerers, using trickery, performed the same feat, but Aaron's serpent turned back into a staff after swallowing the staffs of the magicians (Exodus 5:1 - 5:9, 7:8 - 7:13). The Pharaoh, however, remained unimpressed. He refused to read the signs. His refusal brought to the land of Egypt the famous ten plagues, an account of which is found in the chapters 7-12 of Exodus. The following is a summary of the Biblical account. The first plague was the turning of the waters of the river Nile into blood. The Nile, the river of Egypt, was the Egyptians idol. The Nile's waters nourished the land and determined the welfare of all the people. God instructed Moses to tell Aaron to extend his staff over the river Nile; all of its water turned into blood. As a result of the blood, the fish of the Nile died, filling Egypt with an awful stench. Other water resources used by the Egyptians were turned to blood as well. Pharaoh's sorcerers demonstrated that they too could turn water to blood, and so the Pharaoh made no concession to Moses' demands. The second plague of Egypt was the coming of frogs in droves. God commanded Moses to tell Aaron to stretch his staff over the water, and hordes of frogs came and overran Egypt. In the Egyptian mythology, frogs represented the goddess of fertility, Isis, that was supposed to help women in childbirth. But the frog that symbolized life was left to be raked in heaps of rotting piles of death. Pharaoh's sorcerers were also able to duplicate this plague with their magic. However, since they were unable to remove it, Pharaoh was forced to grant permission for the Israelites to leave so that Moses would agree to remove the frogs. To prove that the plague was actually a divine punishment, Moses let Pharaoh choose the time that it would end. Pharaoh chose the following day, and all the frogs died the next day. Nevertheless, Pharaoh rescinded his permission, and the Israelites stayed in Egypt. The third plague of Egypt was Kinim, variously translated as Gnats, Lice or Fleas. God instructed Moses to tell Aaron to take his staff and strike at the dust, which turned into a mass of gnats that the Egyptians could not get rid of. The Egyptian sorcerers declared that this act was "the Finger of God", since they were unable to reproduce its effects with their magic. The fourth plague of Egypt was the coming of flies in swarms, capable of harming people and livestock. The Torah emphasizes that the arov (swarm or mixture) only came against the Egyptians, and that it did not affect the Land of Goshen (where the Israelites lived). The stinging, disease-carrying flies ruined the land. Pharaoh asked Moses to remove this plague and promised to allow the Israelites to worship God in the wilderness. However, after the plague was gone, the Pharaoh again refused to keep his promise. The fifth plague of Egypt was an epidemic disease which exterminated the Egyptian livestock; that is, horses, donkeys, camels, cattle, sheep and goats. The Egyptians made the Hebrews poor and so God caused great loss to the Egyptians. This disease afflicted only the Egyptian livestock. The Israelites' cattle were unharmed. Once again, the Pharaoh was obstinate and made no concessions. The sixth plague of Egypt was 'Shkhin'. The 'Shkhin' was a kind of skin disease, usually translated as "boils". When the death of their cattle didn't convince the Egyptians, God commanded Moses and Aaron to each take two handfuls of soot from a furnace, which Moses sprinkled up toward heaven in Pharaoh's presence. The soot induced festering 'Shkhin' eruptions on Egyptian men and livestock. In ancient Egypt, sores in the body were looked upon as punishment for sin, a means by which to call one to repentance. None of the Hebrews had any boils. All the Egyptians, including the sorcerers were afflicted, and were unable to heal themselves. The seventh plague of Egypt was a destructive storm. God commanded Moses to give all the Israelites a one-day warning before this plague. The notice was given because the sorcerers of Egypt were also agricultural shamans who supposedly controlled the weather. Those who feared the Lord went into shelter (showing us that God had mercy on some of the Egyptians). Then, by God's order, Moses stretched his staff skyward and immediately the storm commenced. It was even more evidently supernatural than the previous plagues, a powerful shower of hail intermixed with fire. There was ice and fire mingled with the hail, very grievous, such as there was none like it in all of the land of Egypt. The storm heavily damaged Egyptian orchards and crops, as well as men and livestock. The storm struck all of Egypt except for the Land of Goshen. Those who did not believe God and took no shelter died in the fields. Pharaoh asked Moses to remove this plague and promised to allow the Israelites to worship God in the desert. As a show of God's mastery over the world, the hail stopped as soon as Moses began praying to God. However, after the storm ceased, Pharaoh again "hardened his heart" and refused to keep his promise. The eighth plague of Egypt was locusts. Before the plague, God informed Moses that from that point on He would "harden Pharaoh's heart," so that Pharaoh would not give in, and the remaining miracles (the final plagues and the splitting of the Red Sea) would play out. As with previous plagues, Moses came to Pharaoh and warned him of the impending plague of locusts. By this time all the Pharaoh's people including his magicians and advisors began to rebel. Pharaoh stood alone against God. Pharaoh's officials begged him to let the Israelites go rather than suffer the devastating effects of a locust-swarm, but he was still unwilling to give in. He proposed a compromise: the Israelite men would be allowed to go, while women, children and livestock would remain in Egypt. Moses repeated God's demand that every last person and animal should go, but Pharaoh refused. God then had Moses stretch his staff over Egypt, and a wind picked up from the east. The wind continued all day and night, and brought with it a locust swarm the following morning. The swarm covered the sky, casting a shadow over Egypt. Such a locust-swarm had never been seen earlier in the land, nor was it seen afterwards. It consumed all the remaining Egyptian crops, leaving no tree or plant standing. Pharaoh again asked Moses to remove this plague and promised to allow all the Israelites to worship God in the desert. The LORD turned a mighty strong west wind, which took away the locusts, and cast them into the Red Sea; there remained not one locust in all the coasts of Egypt. As promised, God hardened Pharaoh's heart, and he did not allow the Israelites to leave once the locusts were off. The Egyptians rebelled against the light of God's Word and they were justly punished with darkness. When the Pharaoh did not heed the warnings brought home to him by the eighth plague, God punished Egypt with one greater. By God's order, Moses stretched out his hand towards heaven, and a thick darkness set over the land of Egypt. It was a total darkness, a darkness that made impossible for the Egyptians to see one another, a darkness that remained over Egypt for three days. But the people of Israel had light where they dwelt. This plague was an attack on the power of the supreme deity of Egypt, the sun god Re or Amun-Re. The Egyptians could do nothing but stay in their homes and witness the power of the God of the Israelites in awe. Even then, the Pharaoh refused to yield. The tenth and the last plague was the deadliest of them all. It resulted in the death of the firstborn of every Egyptian family, including that of the Pharaoh. God had hardened the Pharaoh's heart so that, in subjugating the obstinate ruler, he could demonstrate his powers and glory to mortal beings. He wanted that his actions be talked about by future generations for all time. So he foretold Moses, that all the firstborn in the land of Egypt were to die that very midnight, from the first born of Pharaoh to the firstborn of the maidservants; and even all the firstborn of the beasts. He ordered Moses to ask all Israelites to sacrifice a lamb, eat the roasted sacrifice together with Matzot ("Poor Man's Bread") in a celebratory feast and mark their doorposts with the lamb's blood. This was to save them from the tenth and final plague. As according to God's declaration the tenth great plague passed over Egypt that night. It was to be the last plague. By Lord's power, every firstborn male child from each Egyptian family died at midnight. Nothing could be heard save wails and moans. Every house of Egypt bewailed its dead. The Pharaoh woke up from his sleep to find all his family members and servants mourning the death of his beloved eldest son. None of the firstborns of the beasts were spared either. Yet a state of calm prevailed over the place where the Israelites dwelled. They were unharmed by the Lord. The distinction was obvious. Lord was with all those who obeyed him humbly and crushed all those who opposed them. The significance of the death of every firstborn in Egypt, from the house of Pharaoh to the slaves and the livestock, was great. Egypt's destruction was complete. Smashed were their hopes, and total their defeat. Without any delay, the Pharaoh summoned Moses and his brother Aaron; he implored them to get out of the land of Egypt taking all the Israelites with them, whom he had kept as slaves. He allowed them to take their cattle and even all that they needed in their safe passage to another land. As the good word was brought to them, the Israelites made preparations to leave Egypt immediately for they feared that the Pharaoh might change his mind and stop them from leaving afterwards. By Moses' order, they took along enough food and water with them and even borrowed from the Egyptians their jewels of gold, silver and raiment who obliged readily. Such was the effect of the Lord's power on their minds that the Egyptians who had until then treated the Israelites as dirt, paid them respect now. They also feared that they might incur God's wrath further if the Israelites had to stay back. They lent them all such things that they required for their journey and wished them a safe passage.